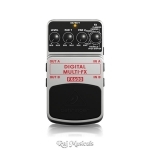 Behringer DIGITAL MULTI-FX FX600 Digital Stereo Multi-Effects Pedal - Studio effects processors sound really good, but they can bulky, complicated and expensive. Studio effects processors sound really good, but they can bulky, complicated and expensive. Now you can have all the power and great sound of studio- grade, stereo effects processing, thanks to the ultra-affordable and easy-to-use DIGITAL MULTI-FX FX600. This amazing little stompbox features a 24-bit, high-resolution stereo FX engine – and your choice of Flanger, Chorus, Phaser, Delay, Tremolo and Pitch Shifter effects. Much like having a studio, full of state-of-the- art Flanger, Chorus, Phaser, Delay, Tremolo and Pitch Shifter FX processors at your disposal, the DIGITAL MULTI-FX FX600’s mind-blowing 24-bit/40 kHz resolution turns your everyday riffs into 3-D epics that bring your performance alive. The possibilities are endless! Just select one of the 6 effects via the dedicated FX knob, and then use the two Parameter dials to fine-tune the effect. The Level control determines how much of the effect is mixed with the original signal. The LED tells you when the FX600 is activated, and the top-quality on/off switch maintains incredible signal integrity in bypass mode. You can power the FX600 with either a 9 V battery or our PSU-SB DC power supply (not included). It has never been so affordable to put a studio-full of awesome-sounding, stereo effects at your feet than with the DIGITAL MULTI-FX FX600. This one incredible pedal gives you a Flanger, Chorus, Phaser, Delay, Tremolo and Pitch Shifter – all in one! 2 additional parameter controls to adjust delay time, flanger rate, etc. RAJ MUSICALS IS AN AUTHORIZED DEALER OF BEHRINGER PRODUCTS.